Looking for Bryant low voltage switches? Find more replacement parts for a Bryant low voltage wiring system under GE low voltage lighting or under Sierra Electric low voltage lighting, depending upon the Bryant low voltage switches you have installed. Both Bryant Uniline and mini rocker low voltage systems are compatible with GE parts, so use any GE switch, relay, or transformer to replace parts. 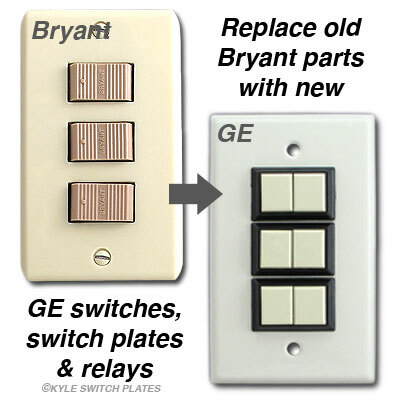 Bryant Rocker Switches - If you need wall plates for Bryant's standard rocker switches, they fit GE's old style switch plates. Bryant Uniline Trigger Switches - If you have a low voltage Bryant Uniline system with thumb shaped trigger switches that fit into small rounded openings, replacement switches and light switch covers are still manufactured and can be found under the Sierra Despard section. 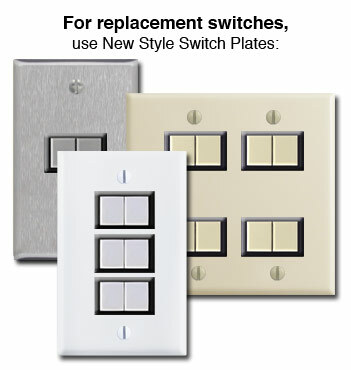 Replacement Bryant Switches from GE - If you want to update your parts - whether rocker or trigger - they may be replaced with any of these 10 styles of new GE switches and these wall switch plates which are compatible with both styles of low voltage switches. A few popular choices are listed below. Replacement Bryant Relays & Transformers from GE - Use any of the GE remote control relays such as the RR7 standard relay and the RR9 pilot light relay, as well as the RT1 GE transformers. See the GE low voltage relay page for additional styles, transformers, and other items. Vintage Bakelite Wall Plates - Bryant Electric of Bridgeport, Connecticut, produced beautiful Art Deco Bakelite switch plates as well as more contemporary ribbed light switch covers for their Uniline series. While those vintage wall plates are no longer manufactured, the confirgurations are still available and feature updated metal finishes and colors. If you are looking for replacements, see Art Deco light switch covers or Despard wall plates for attractive alternatives. 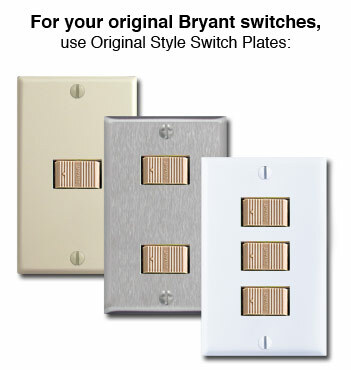 Note: Original Bryant switches are not compatible with the New Style plates & the new replacement switches (made by GE) are not compatible with Original Style plates (this includes your original Byrant switch plates). Click for instructions on fixing a stuck switch. You can update to a more modern, contemporary low voltage lighting system by replacing broken Bryant switches with Touch Plate units. You must replace every Bryant switch with 2 Touch Plate buttons - one will be an "on" button and the other will be the "off" button. Learn more about replacing Bryant with Touch Plate (and purchase lighting controls) at the bottom of the Touch Plate Lighting page here. You can have line voltage and low voltage devices wired into the same electrical box as long as there's a divider between the two.